A few years ago, Tom and I participated in the Global Giveback competition. Sponsored by LINGOs, the campaign paired course designers with humanitarian organizations that needed e-learning. In just over two months, volunteers created more than 40 e-learning projects to help people in the developing world. It was really cool to be a part of something so meaningful. 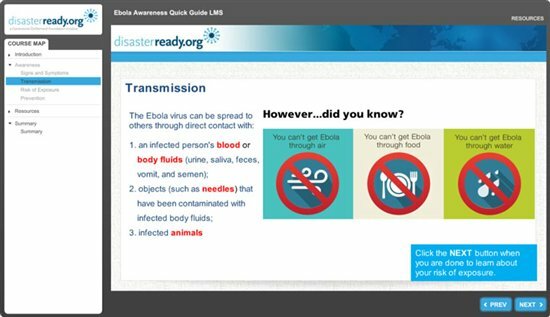 Just last month, LINGOs partnered with DisasterReady.org to share a free, Ebola Awareness Quick Guide. It’s a short course that provides basic awareness on the Ebola outbreak. The course is also a good example of rapid response training. Here are three examples to give you some ideas on how you could approach this week’s challenge. 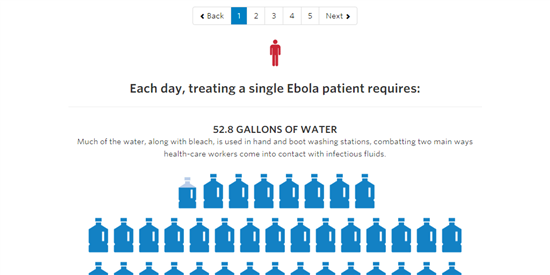 See what’s required to treat a single Ebola patient each day. 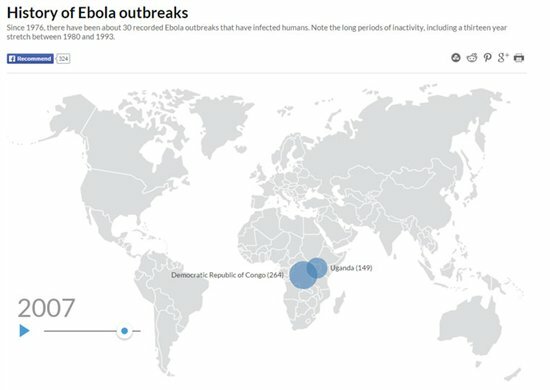 This interactive graphic from NEMJ.org provides information on past and present Ebola outbreaks. Interactive timeline showing the number of outbreaks between 1976 and 2014. The timeline autoplays but can also be dragged for more control. 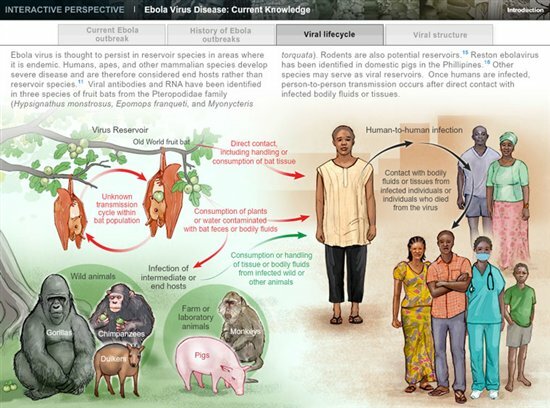 General information about Ebola and the outbreak. How does Ebola compare with other infectious diseases? How do people become infected with the Ebola virus? What do Americans (or citizens of your country) need to know? 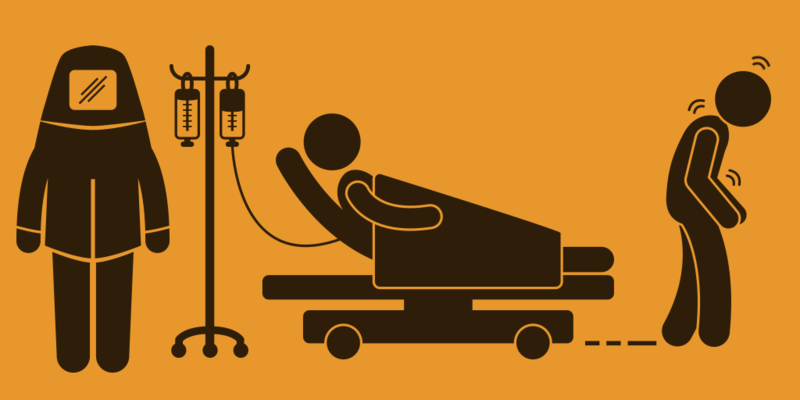 How does Ebola affect the human body? Facebook: Reply to this Facebook post with a link to your example. Wishing you a response-ready week, E-Learning Heroes! @David: Wonderful challenge based on a real-world topic! Kudos David! Totaly agree with you Richard. This is really challenging. I'm already curious about the upcoming entries! Great entry Jeff. You probably did a whole study about Ebola. I really like how you combined a lot of text with the right visuals in this attractive design. Beautiful, Jeff! I like the navigation and transitions. Jeff, really love the design on this one. It is really well done but am having some difficulty wrapping my head around the steps you outlined for procations. Washing your hands often will not protect a person from Ebola. It probably does not matter much because there is about zero chance of anyone in our countries from contracting Ebola but still worry about publishing training of this nature with misinformation. There is a 31 step protocol for taking off protective gear and most healthcare workers that have contracted Ebola have got it from not doing this properly. Lovve it, Jeff! I was wondering about using Articulate in this way, essentially creating an interactive infographic. Great stuff. Hi all, for this demo I used an existing infographic. It stated that the info came from the WHO and a couple of other known authorities on global health. I've not taken any time whatsoever to check the facts and can imagine there is much much more that can be added as Nancy mentions. I kept the design pretty much intact as it was the speed of building that interested me the most. Just used a couple of different fonts, deconstructed the infographic and applied various animations. The whole process took about 1,5 hours. I had not planned on publishing it with Articulate Studio but was curious how the animations would be handled and I must say I'm really impressed. Both flash and html5 do a great job. @Jeff - I saw that you used an existing infographic for this one. I know the WHO promotes hand hygiene as a way of preventing the spread of health care related infections so maybe that is why it was included, but it still seems like an over simplification to me. This might be for another discussion but since this is a design challenge I am wondering if infographics (as much as I love them) are too simplistic a format for some topics? Nice approach Jackie! The images were excellent and Dan's music was just the right touch. I'm working on a few ideas but currently, there appears to be a lot of confusion as to what should and should not be done in regard to Ebola. This is a big week in Dallas as we enter that time period of exposure + 21 days! Hopefully all will turn out well but it has me thinking about disseminating information that may or may not be correct. With that in mind, I'm brainstorming a little more on what I want to deliver for this challenge. Again, good job as usual on your challenge submission this week! @Jeff: By the way, I really liked your submission. Simple and clean...nice work! @Nancy, totally agree. Infographics are an Übercompact form of information often leaving other important stuff out for the sake of form or complexity. @Jackie, great angle, in the end it is all about the people... You've really brought an emotional aspect to the topic and I love how you highlight some of the Heroes that are in the frontlines of the Ebola crisis. Well done. @Jackie, this is a wonderful example. Agree with Jeff that it is very important to put a human face to this crisis. So often we get caught up in the statistics and the fear mongering and we forget that real people are involved. @ Kristin - love the imagery you used. It is very compelling. Wow, these are all so creative! Thanks for sharing your demos and your process for building them. @Jackie - great project, I loved the animation of the text and how the different text sizes draw the readers attention. Really neat navigation too. @Jeff - Loved the vertical layout and how users navigate down the page. Awesome animation and graphics! @Kristin - great job using the "Keep Calm" design, and the animated intro was a really nice touch. I really appreciate the fact that you picked such a hot topic as a challenge! Great examples so far! It's amazing to see the topic from different perspectives. @Jeff, cool and clean design, I dream of a the day when it takes me 1,5 hour to develop something like that ;) @Jackie you show the human perspective of the problem, with big images and reflexions of the victims, well conceived! @Joanna volunteers work plays a vital role, well done pointing it out. Great topic and great submissions so far. I'll have to see if I can get one together. @Jeff - Really liked your fluid transitions!